Commodus: "Do you think I'm afraid?!" Maximus: "I think you have been afraid all your life." Maximus:"Promise me that you will look after my family!" Quintis:"Your family will meet you in the afterlife." Maximus:"If you find yourself alone, riding in green fields with the sun on your face. Do not be troubled, for you are in Elysium, and you're already dead!" Commodus: "He's made his decision. He's going to announce it. He will name me. And the first thing I shall do, when. Is honor him with games worthy of his majesty." Lucilla: "For now, the first thing I shall do is have a hot bath." Marcus Aurelius:"If only you had been born a man. What a Caesar you would have made." Commodus: "Smile for me now brother." Commodus: "You simply won't die!" Gladiator: "Go and die with honor!" 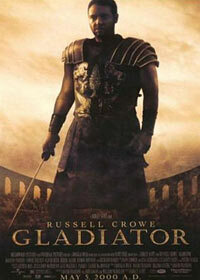 Maximus:"Marcus Aurelius had a dream that was Rome, Proximo. This is not it! This is not it!" Proximo:"Do any of them fight? I got a match coming up." Slave Trader:"Some are good for fighting, others for dying. You need both I think." Maximus: "Are you not entertained?! Are you not entertained?! Is this not why you are here?!" Commodus:"I doubt many of the people eat so well as you do Gracchus. Or have such splendid mistresses Gaius. I think I understand my own people." Gracchus:"Then perhaps Caeser will be so good as to teach us. Out of his own extensive experience." General:"Back to barracks general? Or to Rome?" Maximus:"Home. Wife, son, the harvest." Quintus:"Maximus the farmer. I still have difficulty imagining that." Maximus:"You know dirt cleans off a lot easier then blood Quintus." Marcus Aurelius: "Enough of politics. Let us pretend that you are a loving daughter, and I am a good father." Lucilla: "This is a pleasant fiction, isn't it." Gracchus: "I don't pretend to be a man of the people Senator, but I do try to be a man for the people." Maxmius:"The frost, sometimes it makes the blade stick." Maximus:"Proximo, are you in danger of becoming a good man?" Maximus:"At my signal, unleash hell." Gracchus:"He enters Rome like a conquering hero, but what has he conquered?" Falco:"Give him time Gracchus, he's young. I think he could do very well." Gracchus:"For Rome or for you?" Commodus:"My history is a little hazy Cassius, but shouldn't the barbarians lose the battle of Carthage?" Cassius:"Uh yes sire, forgive me sire." Proximo:"Come on! How long does it take to get into my own house!?" Maximus:"I am required to kill so I kill. That is enough." Juba:"You have a great name. He must kill your name before he kills you." Juba:"Don't die. They'll feed you to the lions. They are worth more then we are." Gracchus:"Conjure magic for them and they'll be distracted. Take away their freedom, and still they'll roar. The beating heart of Rome is not the marble of the Senate. It's the sand of the Colosseum. He'll bring them death, and they will love him for it." Proximo:"Ultimately, we are all dead men. Sadly we cannot choose how, but we can decide how we meet that end. In order that we are remembered, as men." Commodus: "Am I not merciful!?" Commodus: "Have I missed it? Have I missed the battle?" Marcus Aurelius: "You have missed the war." Marcus Aurelius: "Commodus is not a moral man. You have known that since you were young. Commodus cannot rule. He must not rule." Maximus: "My name is Maximus Decimus Meridius. Commander of the armies of the north. General of the Felix legions. Loyal servant of to true emperor Marcus Aurelius. Father to a murdered son, husband to a murdered wife. And I will have my vengeance, in this life or the next." Juba: "Now we are free, and we'll see you again. But not yet, not yet." Gracchus: "Have you ever embraced someone dying of plague sire?" Proximo:"Those giraffes you sold me. They won't mate. They just walk around eating, and not mating. You sold me queer giraffes." Gladiators: "We who are about to die salute you!" Maximus: "Haha! You knew Marcus Aurelius?" Proximo: "I did not say I knew him! I said he touched me on the shoulder once!" Lucious:"They said you were a giant. They said you could crush a man's skull with one hand." Maximus:"A man's? No... A boy's." Maximus: "The emperor has been slain!" Maximus: "Do you not understand? I may die in this cell tonight, or in the arena tomorrow. I am a slave! What possible difference can I make!" Maximus: "I knew a man who once said 'death smiles at us all. All a man can do is smile back'." Commodus: "I wonder, did your friend smile at his own death?" Maximus: "You must know, he was your father." Falco: "Your loyal subjects bid you welcome highness." Commodus: "Thank you Falco, and for the loyal subjects. I trust they weren't too expensive." Proximo:"That's enough for the moment! His time will come." Maximus: "Anyone here been in the army?" Gladiator: "Yes, I served with you at Vindobona." Maximus: "You can help me. Whatever comes out of these gates, we've got a better chance of survival if we work together. Do you understand? If we stay together we survive. Juba:"Spaniard, why don't you fight? We all have to fight." Maximus: "I will win the crowd. I will give them something they've never seen before."